How do you paint bright light? If you know how light sources affect the temperature of the colors on the objects, you will understand how to mix the right whites for your paintings. Where I live, the light from northern exposures is always cool and therefore the color temperature is cooler. So, for example, if you are painting a bowl of eggs over a white drape in the light of a north-facing window, the colors would appear cool. Hence you would tint the white with cool blue, green, and cool yellow. If you were painting a bright pink flower under the same light conditions, you would tint the white color with a touch of cool red, such as alizarin crimson. If, on the other hand, you shine warm light on your bowl of eggs, then they would take on a warm tone. In this case—you guessed it— tint the white with warm colors to reflect the nature of the light source. In the above examples we spoke only of a single tone to the light (either warm or cool). But once you know what to look for, you will see that white objects can reflect the bright light in both cool and warm tones. In a painting depicting sunny days, for example, you are likely to see both temperatures at play. 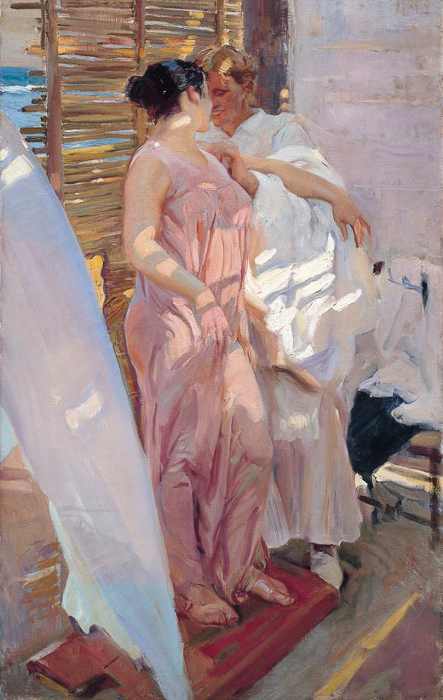 To illustrate this, take a look at the painting “The Two Sisters” by Joaquin Sorolla, a Spanish impressionist painter. In this painting, notice how both warm whites and cool whites are used in various spots even though the light source itself is warm. The sea in the background is a very cool white because it reflects the blue sky. In contrast, the dress of the older girl is painted with warm whites. Up close, you would even see variation within these warm whites in the girl's dress. The lower portion of her dress takes an orange cast from from the sunlight reflecting off the beach. Her shoulders are painted with whites tinted with warm yellow. As the brightest spot on her, the shoulders emphasize the warmth of the sunlight. They contrast with the near orange skin of her face and the cool band of blue behind her to form a strong focal point for the painting. Here is another painting by Sorolla to reinforce the idea of using contrasting warm and cool whites to create an interesting color scheme. In the painting titled “The Pink Robe. After the Bath.”, the sun is at its highest point of the day...you can feel the heat of the sun on the lady in pink dress. 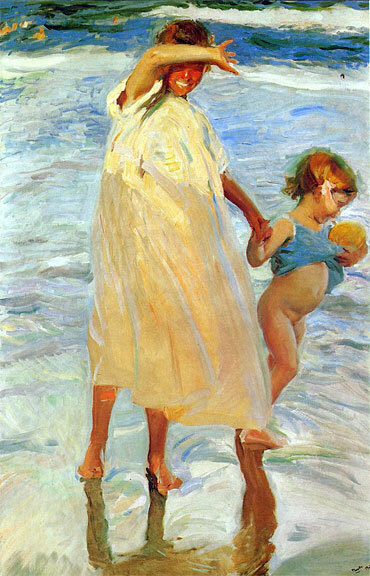 Sorolla painted warm orange whites on her neck, arm, and hands. This is contrasted by the bluish whites on the white clothes worn by the second lady. Note that there is also a brilliant yellow white on the white robed lady's hair. Like the “The Two Sisters”, the warm and cool whites in “The Pink Robe” are placed side by side to enhance the visual interest. Imagine if all the whites you used were tinted with the same colors; the colors would not draw your eyes in the same way. Also notice that the shadows on the white objects are not always grayed or tinted using the same color. There are variations of warm and cool colors in the shadows as well, just slightly darker than the colorful whites in the light. The use of these colorful whites creates a very engaging visual path that leads your eyes throughout the painting. So you can bring brilliant light into your paintings by knowing the above simple principles. Keep in mind that value harmony should always precede the color choice. Exercise restraint to keep from using too much white; this will keep your paintings from becoming too chalky or simply overwhelmed with a starchy, lifeless white. One last tip: it is always alright to portray the white slightly darker than what your eyes actually see. Happy Painting! 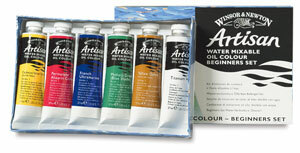 Have not tried water mixable oil paints? Click here to discover the exciting invention that is just as good as traditional oil paints. Learn more about Colors here.